I just love boutiques and card shops, and all the unusual, eclectic goods you find there. Of course, I’m particularly fond of custom lettering – those perfectly, imperfect characters that make the work so unique, so naturally I had to give my own version a shot. I’m proud to introduce: Boutique Script, an organic, fun, & kitschy homage to the boutique-style lettering that I love so much. Boutique Script (.OTF & .TTF Files), including Western European language support and ligatures. 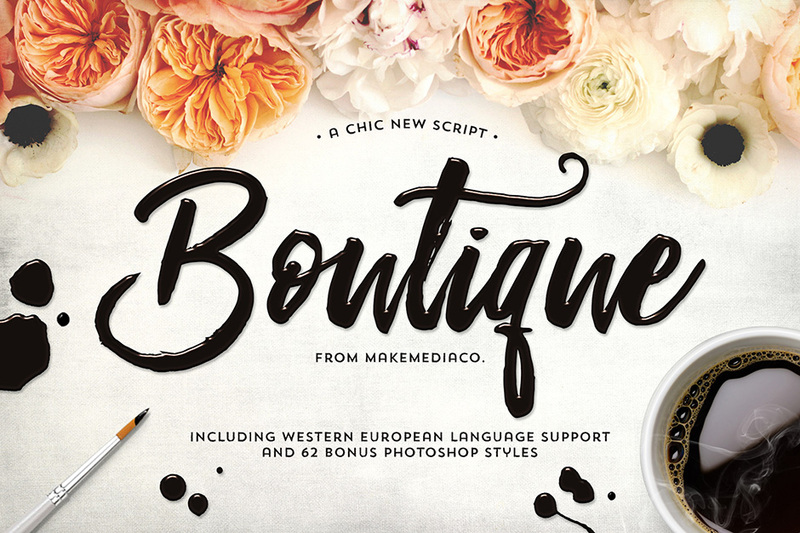 • 62 ‘one-click’ Photoshop Styles (Including watercolor, trendy rose gold foils and faux ink) to make your text pop + Installation Instructions. • An unflattened .PSD with all the characters (so you can cut and paste without a glyphs panel). • The .ASL file is huge, and it’s gonna take a minute (or 5) to download, so please make sure the file is completely finished before you unzip or the styles may be missing. • It’s really nice to have that Glyphs Panel for the extra characters, but not necessary. If you have an older version of Photoshop, you can just cut and paste from the enclosed .PSD file. Software Compatibility for PSD Styles: Adobe Photoshop CS and newer. Software Compatibility for .PSD Styles: Adobe Photoshop CS and newer. File size is approx 169.1MB (230.4MB unzipped), offered as a single download.